We all know the struggle of giving pets a bath. They run, hide, jump, and try to avoid getting wet at all costs. Pets don’t love to be groomed, but you can make the experience more enjoyable for them with the help of a dog bath tub. Why Does A Dog Bath Tub Make Bathing Pets Easier? Using a dog bath tub helps your pet feel stable and secure during bath time. How? The enclosure helps keeps you pet in place, and prevents them from jumping out. The bottom of the dog bath is also made to keep your dogs feet from sliding, unlike tubs and showers made for people. It’s important to pick the best dog bath tub according to your pets size, to make bath time easier for everyone. The most important thing to consider when choosing the best dog bath tub, is the size. A small dog like a mini schnauzer would be happiest in a small dog bath tub, but a large doberman needs an enclosure with high walls to keep them secure. To make it easy, we break down the dog bath size options for large dogs, and small to medium size dogs. There are a few different types of pet bath tubs, and it’s pretty easy to figure out which type will be useful for you and your pet. Some pet baths simply provide a basin to enclose your pet, and some allow you to hook the bath up to your sink or hose. Some can be used indoor and outdoor, and some provide a harness system inside to keep your pet secure. We outline all the important features of each dog bath tub so you can make best choice for your furry friend. The Home Pet Spa is a great choice for larger dogs, and dogs that struggle a lot during bath time. Why? Because the high walls on this pet spa help the dog to feel safe, and prevent them from jumping out. 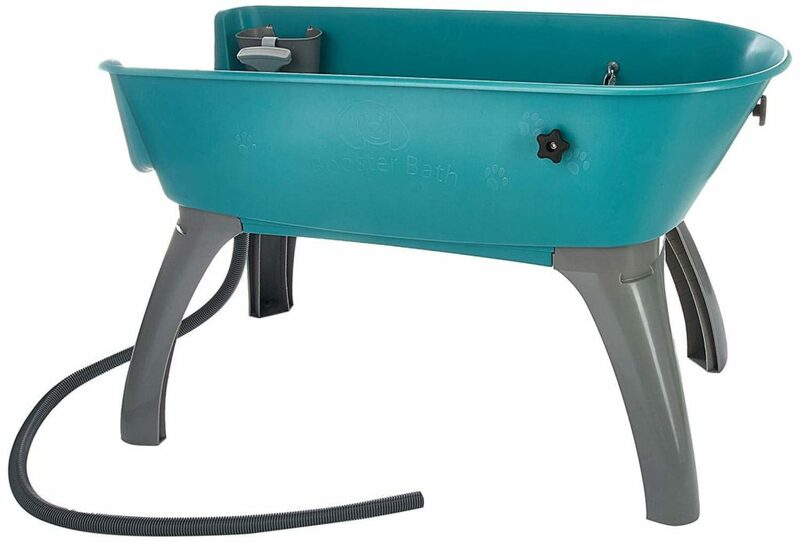 This dog bath tub measures 35 x 25 x 29 inches, and is made in the United States. It hooks up to any faucet, and comes with jets and a shower wand to easily reach your pet all over. It also features really handy entry and exit doors, so you can lead your dog in without having to lift them. Finally, this tub comes with a pet safety restraint so you can secure your pet for bath time. The Booster Bath X-Large elevated pet bath is the perfect choice for bathing big dogs indoors or outdoors. The bath measures 50” L x 21.25” W x 32.25” H, and is also made in the U.S.A. It elevates your pet giving you 360 degree access, and keeps you from having to bend down for long periods of time. It’s a nice feature to have since bathing big pets can take a while. 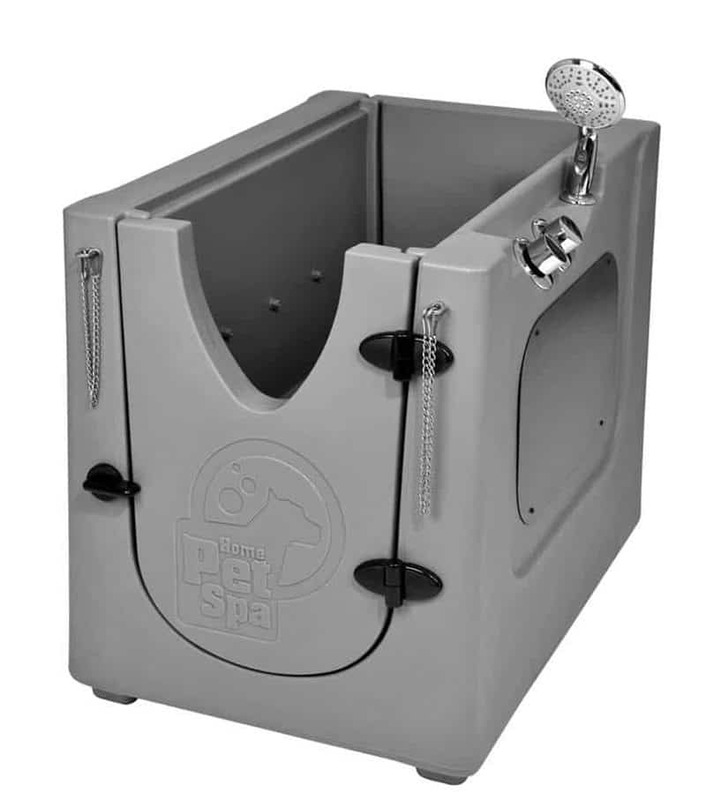 The Booster bath also comes with a useful retraining system to keep your pet stable and secure. The bottom of the tub has a handy no slip bottom, and an interior caddy to hold bath time supplies. Finally, the Booster Bath Tub has a useful sprayer attachment and draining system to make bathing a breeze. The Flying Pig Professional Grooming System is the holy grail of all dog bath tubs. It’s a great pick for pet owners with multiple dogs, who spend a lot of time bathing their furry friends. It measures 62 x 27 x 58 inches, and is made from super durable stainless steel. The back and side splash guards keep you dry, while the elevated height will save your back during bath time. 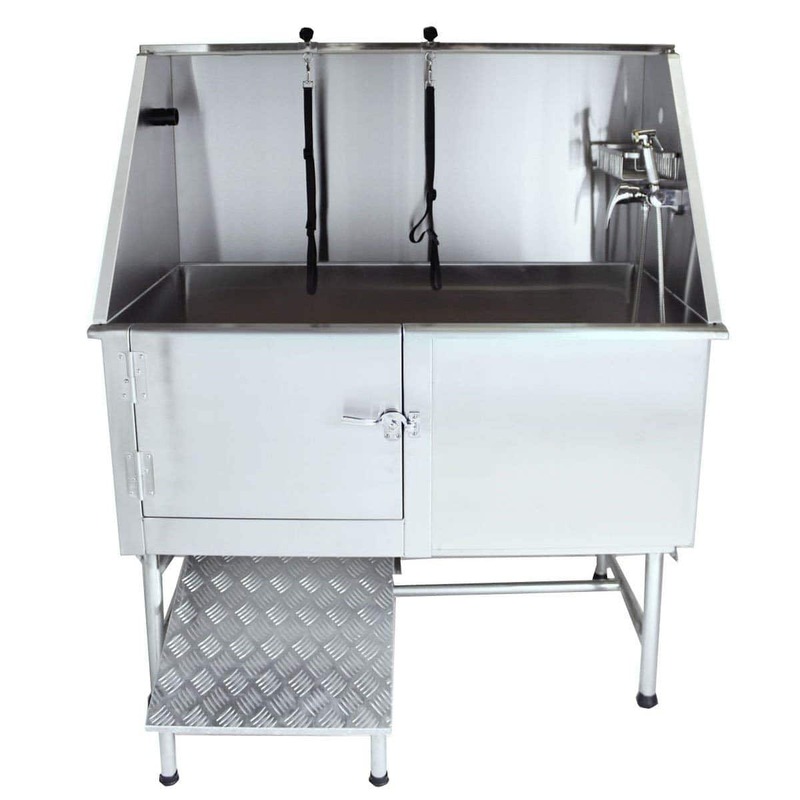 The flying pig grooming station has some other very useful features like the walk-in ramp, faucet and sprayer attachment, and adjustable floor grates that adapt to small or large dogs. The easy drain kit, restraint system, and stainless steel shampoo rack all help to give your pet a quick and easy bath time, just like a visit the groomers. 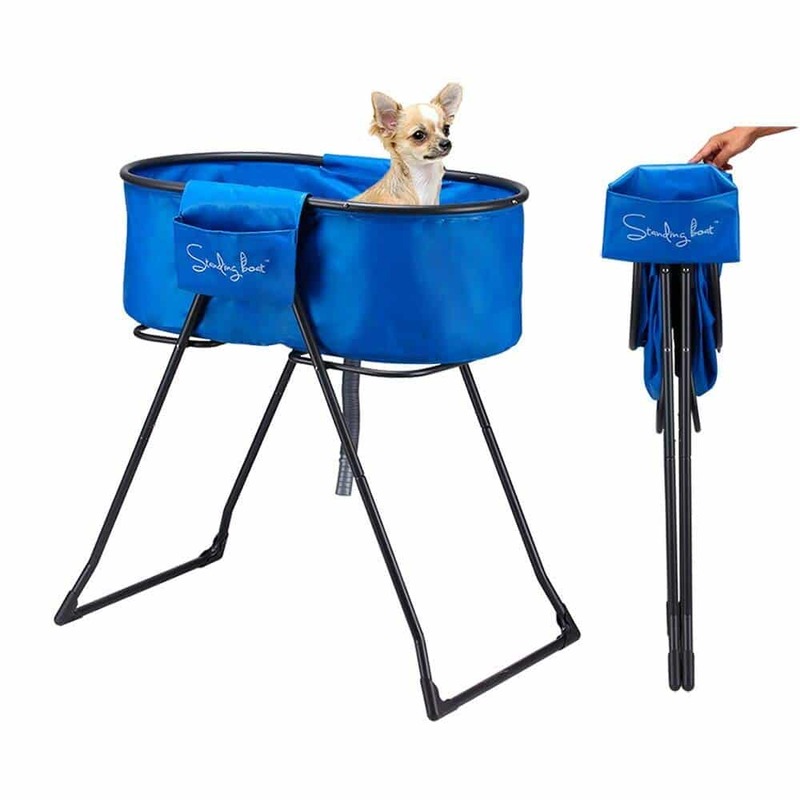 This foldable dog bath is like the camping chair in a bag, of pet baths! It’s lightweight, portable, and great for indoor and outdoor use. It features a simple design, that can be set up in less than 10 seconds, and measures 35.5 inches x 21.6 inches x 35.5 inches. It’s super handy for giving your pet a quick bath, and the elevated design eliminates the need to bend down. It’s sturdy enough to hold a dog up to 150 lbs, and has a handy draining system to easily clean up after bath time. The Booster Bath medium elevated pet bath is a stylish and practical choice for bathing small and medium dogs both indoor or outdoor. The bath measures 33” L x 16.8” W x 33” H and is made in the United States. 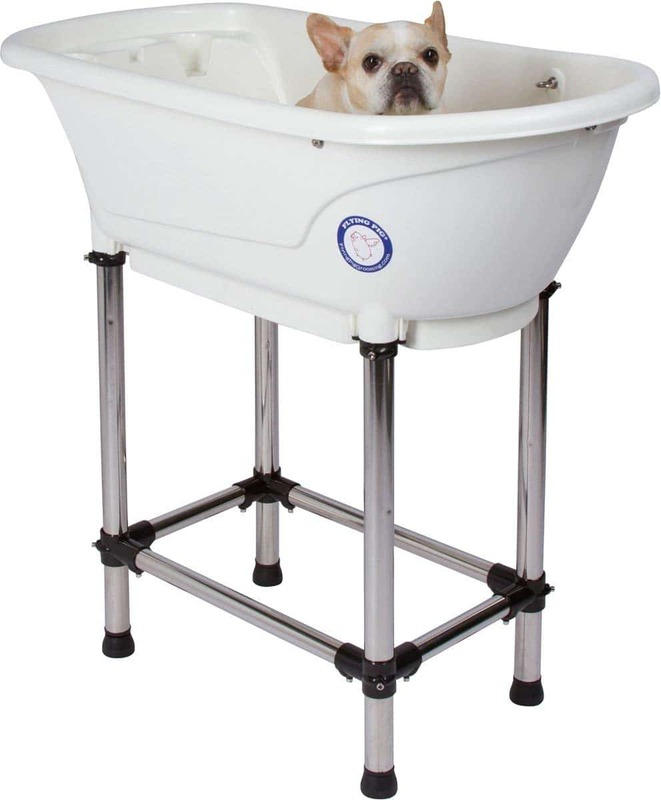 Like the other elevated dog bath tubs, this one is gentle on your back while giving you 360 degree access during bath time. 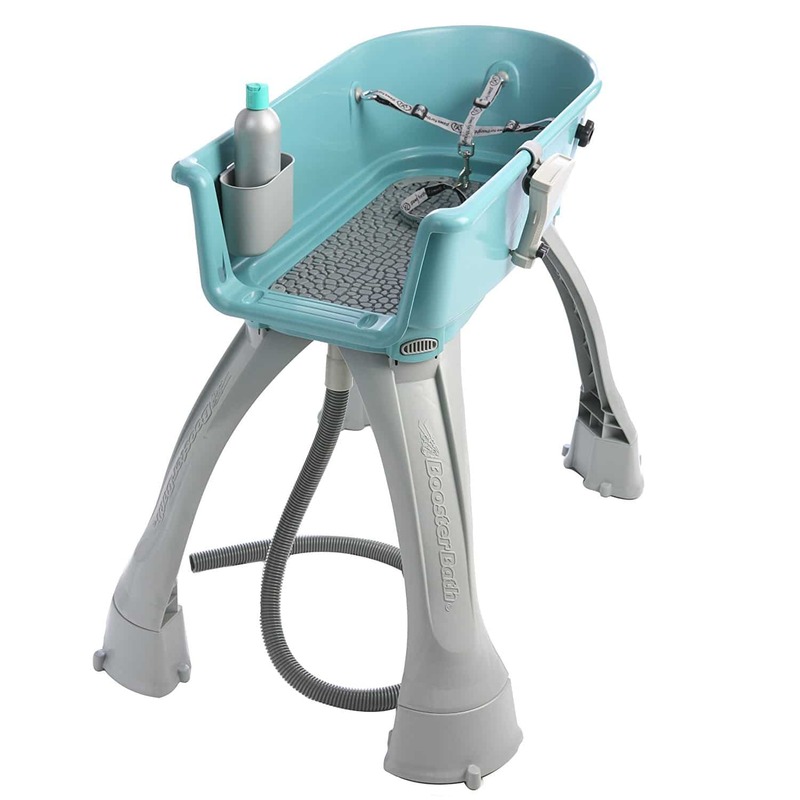 The Booster bath also comes with a restraint system, a no slip bottom, and a shampoo caddy. The Booster Bath Tub also has a sprayer attachment and draining system to make bathing a breeze. 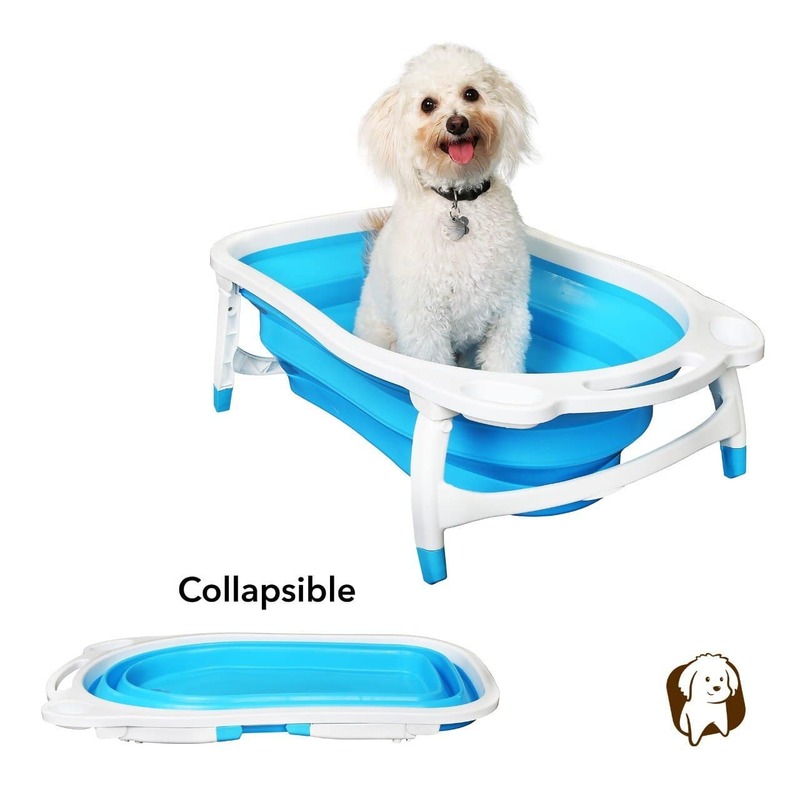 The Baily Bear foldable tub is one of the smallest and most portable options for a dog bath tub, perfect for using indoor and outdoor. This foldable tub measures 31.5 inches x 17.3 inches x 8.7 inches, but collapses down to 2.4 inches thin when not in use. It’s small size makes it a great pick for people who live in small places without a lot of storage. This dog bath tub also features two handy storage trays to stash bath time supplies, and is ideal for pets up to 25lbs. The Flying Pig portable tub has a sturdy design with stainless steel anti skid legs, making it ideal for using inside and out. The tub itself is 31.5 inches x 17.3 inches x 8.7 inches, perfect for small and medium pets. One of the most useful features about this dog bath tub is the leveling feature on the legs, which adjusts for uneven ground. The tub also had a drain hose connector for easy clean up, and a handy shampoo caddy. Finally like many of our other picks for best dog bath tub, this one also has an elevated design preventing sore backs! This K9 Bath Buddy is a handy pet toy to keep dogs distracted during bath time. 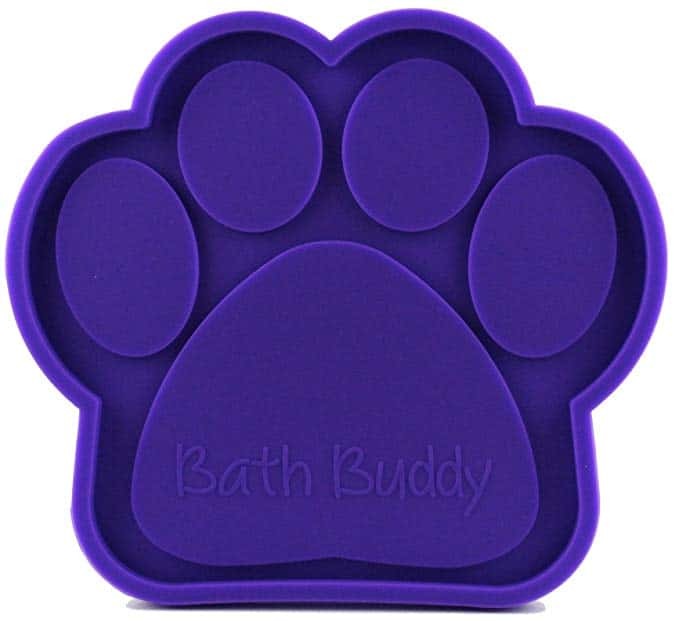 Simply stick this paw shaped pad to the dog bath tub wall, and spread on a little bit of peanut butter. Your dog will be so distracted with the treat, they won’t mind that it’s bath time at all! 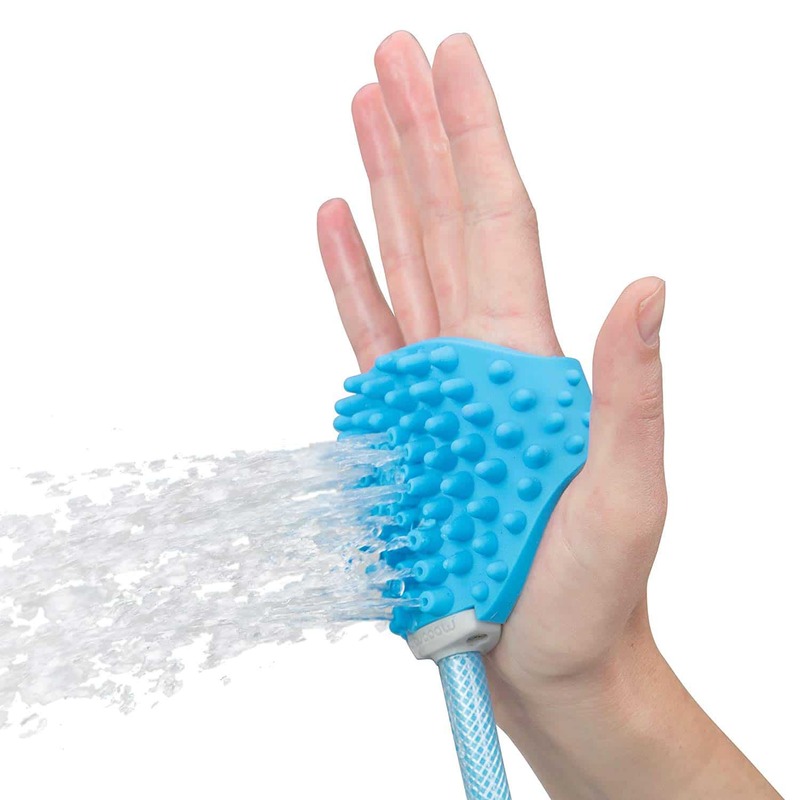 The Aquapaw hand held sprayer gives you full control over your pet during bath time. The sprayer helps soak through even super dense fur, and speed up bath time for happier pets! The Tuff Pupper’s Quick Dry Shammy Towel has the highest absorbency for water, plus the hand pockets help you dry your pet more quickly and easily. 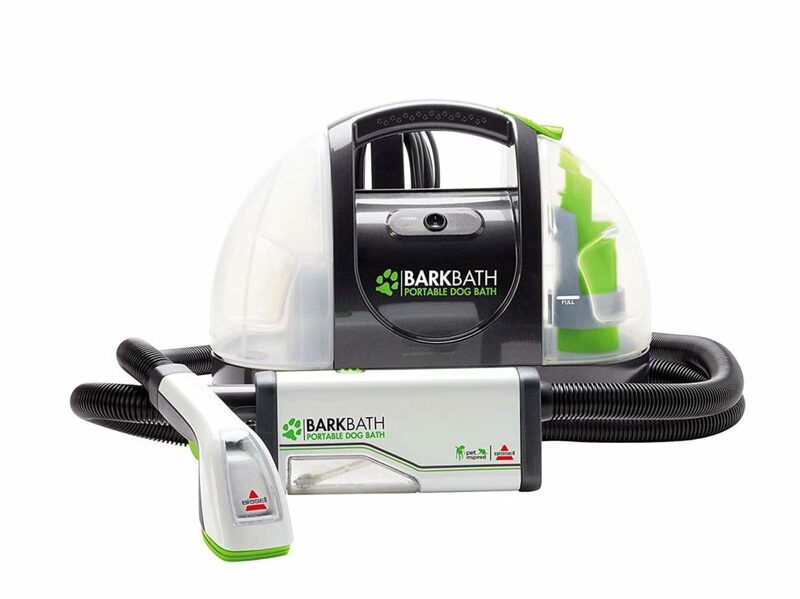 For cleaning your pet between baths, the Bark Bath portable dog bath system is the best way to go. 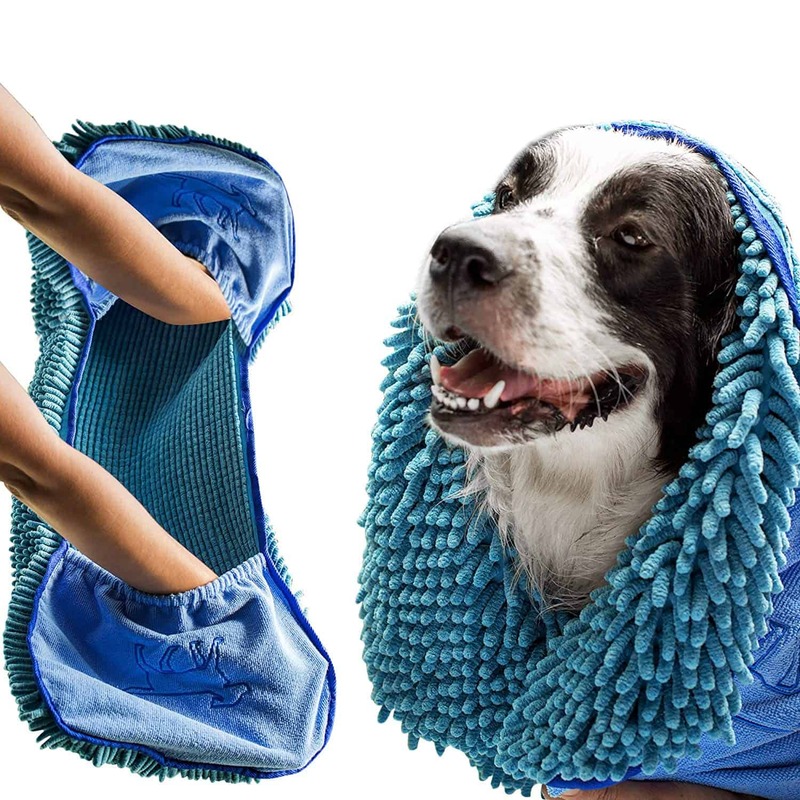 It works like a small vacuum, cleaning, and drying your pet all in one quick motion!